BUT I HAVE RETURNED…. Yes, that’s right, The Friday Files has been MIA for a while. Anyway, on topic, I am fairly indifferent to that song. 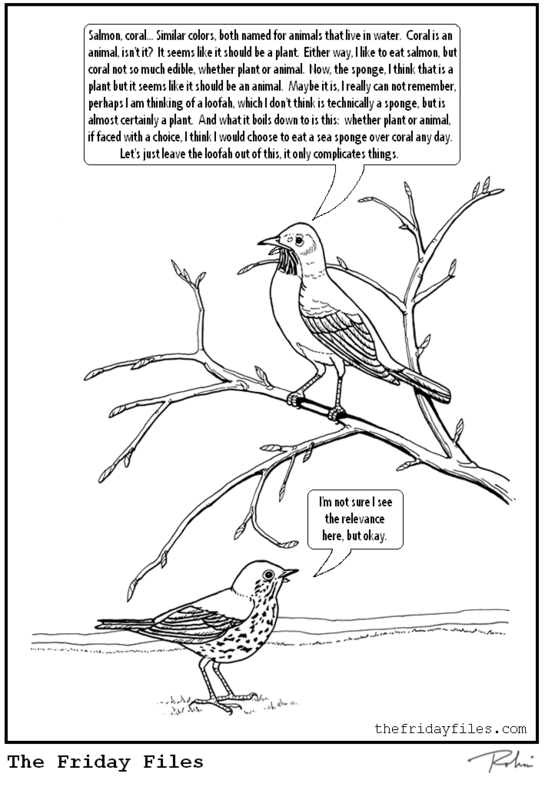 However, I thought you might like to know what birds talk about. Well, each bird is an individual, of course. But they’re all pretty flighty. Whatever. Oh forget it. I’m just winging it here anyway. If anyone even reads this, it will certainly be a feather in my cap. I could go on, you know. Yes, yes, I believe you do know. I don’t want to cause any flap though, so without further delay, I give you a flight of fancy. Oh stop it. Just, here………. I’ve been working on my pecks.